Here they come... like always: The Holidays. Where to go for 2012? We always go somewhere for the holidays in December...it's not that we don't like Hyderabad...it's just that the holidays are the one time in the year that we really miss being at home in the U.S. Your mileage may vary, but... we have found that it's not easy being away from family and friends at Christmas-time. When we're at home, we have a great system where we trade-off years with Amy's sisters and their families up in Northern California...one year they come down to Pasadena...the other years we go up to see them. Our last Christmas together was up in San Francisco in December of 2009, when we had first brought up the idea to the family about moving to India. Since we've been in Hyderabad, we like to pick a place to go and spend Christmas and New Years in a special place. Last year we did our African Safari. This year: Australia! The trip did not actually start well when we landed in Melbourne. For some reason we missed our connection with our driver at the airport...(we ended up taking a taxi) ... and when we got to the hotel, there was no record of us having a reservation... As it turned out...there were two slightly different itineraries and we only had one of them! Things got straightened out and that was really the last of our problems! We ended up at a great hotel...the Crown Promenade - which was actually connected to the Casino and the hotel where we had our original reservations!! Melbourne is a cool city. Not temperature wise...it got pretty warm...but it seems like it might be a pretty neat place to live... artsy, sports-crazed, lots of nice restaurants. 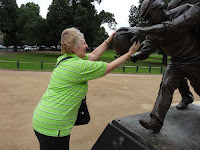 Our tour-guide took us all over on day-one... shopping, the Melbourne Cricket Grounds (a cathedral of sorts for the cricket-fans of the world!)... and we got our steak on at the local Meat and Wine Company - - we had a lot of good meat in Australia - but that first steak in Melbourne ended up being the best one of the entire vacation!! The only bummer about our Melbourne stay was that we missed connecting with our friends Hasan and Sudha... a couple from Melbourne who we actually met during our Africa tour the year before. Just bad timing... We hope that we get to see them here in India this year!